In this episode, Nadia Myburgh is in conversation with multidisciplinary artist Jared Aufrichtig at the David Krut Projects Bookstore in Parkwood, Johannesburg. 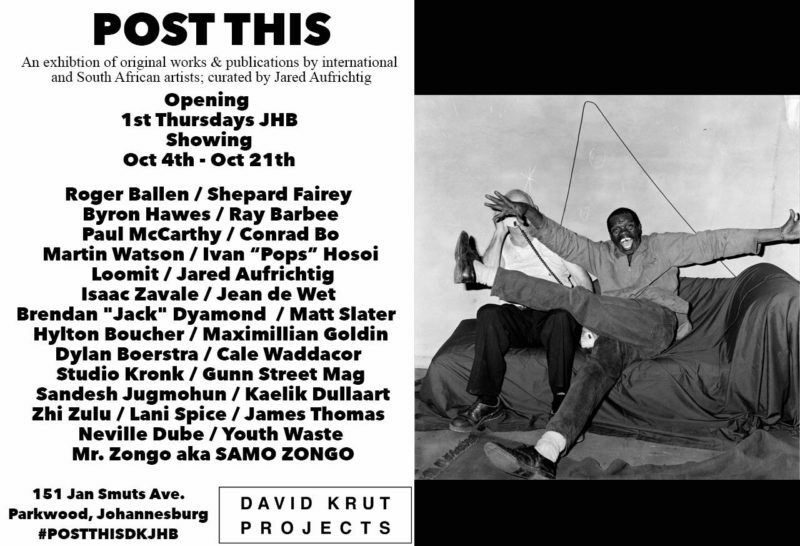 Be Sure to have a look at the exhibition at the 151 GALLERY called POST THIS which will be up until the 20th of October 2018, Located at 151 Jan Smuts Ave, Parkwood. 13:41- 15:03: On his multi-layered thinking and multidisciplinary practice 15:03 – 19:05: On his creative process and the relationship between all the mediums he uses – how one medium informs the next. 45:42 – 49:40: What to expect at the upcoming zine exhibition for First Thursdays 4 October and the artists involved.